Last week in Frankfort, Representative Al Gentry along with Representative John Sims, filed patient-driven legislation that, if passed into law, would legalize the cultivation, processing, production, distribution, and administration of a tightly-regulated Medical Cannabis Program in Kentucky. This bill was created and drafted after exhaustive research of the Cannabis Programs in 29 other states, and as a result, makes it potentially the best Cannabis law in the country. The three primary goals of the legislation are: 1) to limit availability only to medical patients in need, 2) to provide comprehensive oversight and tight regulation of the entire Program, and 3) to maximize the positive patient-health impact & economic benefits. Thousands of Kentuckians, including veterans, suffer from a variety of mental and physical disorders such as cancer, glaucoma, epilepsy, severe chronic pain, PTSD, Parkinson’s, and Alzheimer’s, just to name a few, that medical cannabis has proven to be an effective treatment for. 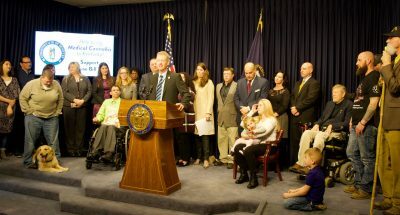 This bill provides suffering patients of Kentucky another treatment option that, in many cases, drastically reduces harmful side effects produced by many current prescription drug options. Besides bringing new health benefits to patients of this state, the Cannabis Program also creates a new industry, and with it, new jobs, and much needed new tax revenues. It also allows Kentucky to position itself, due to natural climate conditions and geographic location, for future significant cash-crop-export potential should federal legislation ever be passed to permit interstate commerce. Upon passage, Kentucky would become the 30th state to legalize medical cannabis. It is simply past time to do this for ailing Kentuckians.